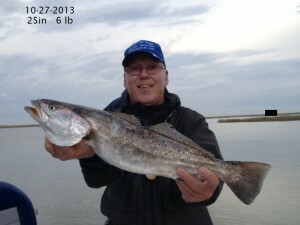 October 30, 2013 Leighton & Bob Catch Big Trout & Reds on Lake Calcasieu Before the Storm Comes!!! 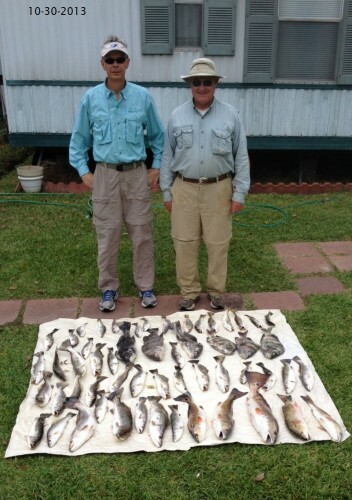 ctober 30, 2013 Leighton & Bob Catch Big Trout & Reds on Lake Calcasieu Before the Storm Comes!! Nice Trout ,several 2 & 3 pounders and some Reds to 8 lbs. 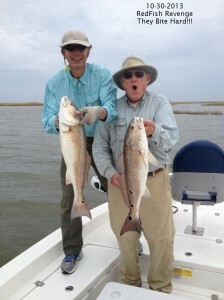 Bob found out the hard way how hard Reds bite in RedFish Revenge!!! 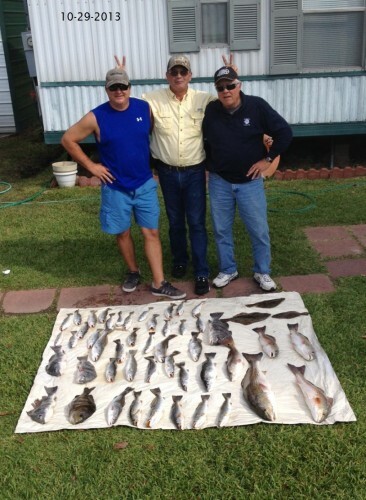 October 29, 2013 Mike H. , Dad, & Friend Dan Have a Great Time on Lake Calcasieu!!! 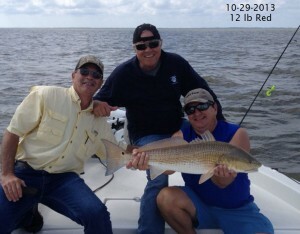 October 29, 2013 Mike H. , Dad, & Friend Dan Have a Great Time on Lake Calcasieu!! The wind was blowing but the rods were bending and with a bit of skill and luck the cooler was full of a nice Big Lake mixed bag! Mike topped it off with a Nice 12 lb Big Lake Bronze Beauty!!! October 27, 2013 Freddie F & Class of “63” Mates Nilas Y. 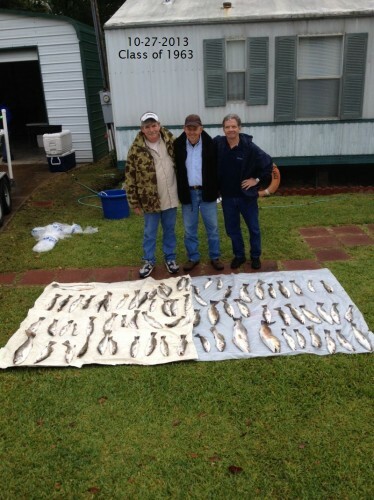 & Ken R. Catch an Incredible Lake Calcasieu Limit By 9 AM!!!! October 27, 2013 Freddie F & Class of “63” Mates Nilas Y. 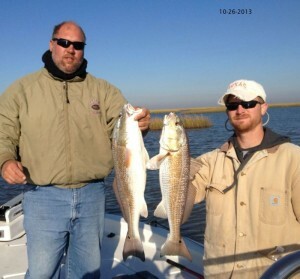 & Ken R. Catch an Incredible Lake Calcasieu Limit By 9 AM!!! Captain Tom Helped a bit with this 25 inch 6 lb Speck !!! October 26, 2013 Bachelor Party Day 2, It was Some Nice 6 & 8 lb Big Lake Bronze Beauties Today! Plus Some 3 # Hackberry Halibut!!! October 26, 2013 Bachelor Party Day 2, It was Some Nice 6 & 8 lb Big Lake Bronze Beauties Today!! Plus Some Nice 3# Hackberry Halibut!!! 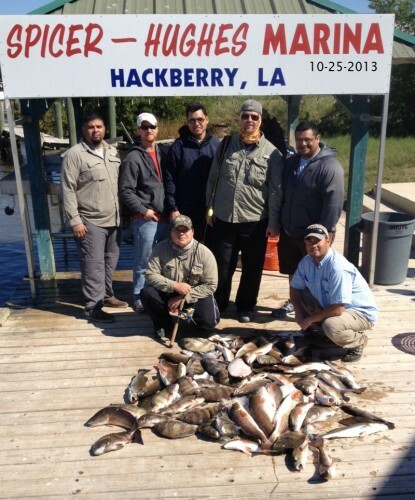 October 25, 2013 Seth P., Adrian & Friends Have a Bachelor Party and take Time to Fish Lake Calcasieu. Winds blew 25+ All Day but the Fish are Hungry!!! 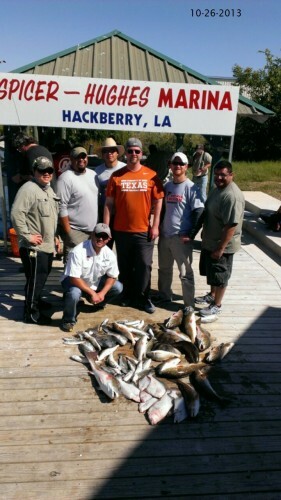 October 25, 2013 Seth P., Adrian & Friends Have a Bachelor Party and take Time to Fish Lake Calcasieu. Winds blew 25+ All Day but the Fish are Hungry!! Adrian could not keep them off his hook! It was a great Big Lake Mixed Bag!!! October 24, 2013 Howard L. & Friends Kurt & Daniel Catch a nice Mess On Lake Calcasieu!!! 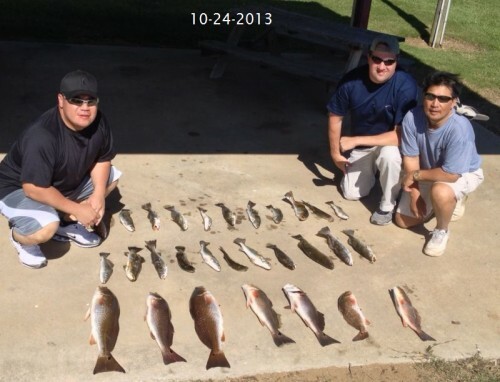 October 24, 2013 Howard L. & Friends Kurt & Daniel Catch a nice Mess On Lake Calcasieu!! A combo of Live shrimp amd Berkley Gulp helped these guys put a nice mess in the box!! !